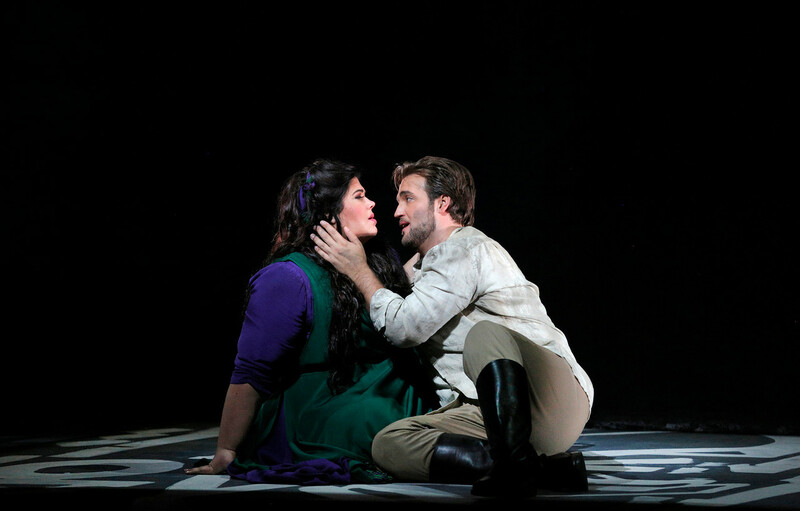 Leah Crocetto as Aida and Brian Jagde as Radames in Verdi’s “Aida”. Photo Credit: Cory Weaver/SF Opera. So, the first thing to know about “Aida” is that it is one of the most popular operas ever written, with thousands of performances, all over the world. In terms of spectacle, story, sweep, and grandeur it is the very definition of “opera” — from its most sublime to its most silly. Opera lovers relish the stories of overblown staging (elephants, acrobats, scenery of a size that tries to recreate the Pyramids or the Sphinx) and diva disasters (horses and elephants will do things on stage that no human actor would). The triumphal fanfare featured in Act I, Scene 2 is as famous and easily recognizable as the opening of Beethoven’s Fifth Symphony or the William Tell Overture. All of this brouhaha can obscure the wonderful music, and in the current production, much of the spectacle has been scaled back to allow the score (presented uncut) to be front and center. Many disappointed opera fans may miss the spectacle, but nobody can fault the musical results. Visually, this is a most unusual “Aida,” with none of the traditional Egyptian headdresses or references to sphinxes and pyramids. Instead, the design has been inspired by graffiti artist RETNA, whose work features his own original hieroglyphic symbols, which are influenced by Egyptian forms but also modern graffiti and medieval illuminated manuscripts. The result is interesting, exotic, and haunting, but also quite simple, allowing primacy to the music. And that’s a good thing. In an interesting article published in the program (and well worth reading), Brian Kellow make the case for “Aida” as chamber opera, noting that, aside from the famous Triumphal scene, it consists almost entirely of scenes featuring only two to four voices accompanied by subtle orchestration. And what voices we have in this “Aida.” American Soprano Lea Crocetto (Aida) has matured from promising Adler Fellow in 2009 to full fledged diva in 2016. As Radames, Brian Jagde, also American, also a former Adler Fellow, is her perfect match. One of the highlights of this production is the convincing rapport between these two stars whose personal chemistry is as beautifully blended as their voices. All told, opera fans expecting a traditional, over-the-top, orientalist staging of “Aida” may be disappointed, but others may well find new depths of appreciation for Verdi’s music in this finely sung and acted production. “Aida” continues at SF Opera through December 6th at the War Memorial Opera House. For futher information , click here. “Aida” by Giuseppe Verdi, libretto by Antonio Ghislanzoni. Director: Franceso Zambello. Conductor: Nicolai Luisotti. Artistic Designer: Retna. Set Designer: Michael Yeargan. Costume Designer: Anita Yavich. Lighting Designer: Mark McCullough. Choreographer: Jessica Lang. Chorus Director: Ian Robertson. Fight Director: Dave Maier. Aida: Leah Crocetto. Amneris: Ekaterina Semenchuk. Radames: Brian Jagde. Amonasro: George Gagnidze. Ramfis: Raymond Aceto. King of Egypt: Anthony Reed. A Priestess: Toni Marie Palmertree. A Messenger: Rene Pati. Posted in Reviews.Tagged Aida, Brian Jagde, Charles Kruger, Ekatarina Semanchuk, George Gagnidze, Leah Crocetto, RETNA, San Francisco bay area theater reviews, San Francisco Opera, theatrestorm, Verdi.